New, superbly designed and appointed 2 and 3 bedroom serviced apartments give you space and luxury in a modern, affordable hotel-style accommodation. At a spacious 112 m2 per unit, you will have plenty of room to relax and enjoy your stay in our modern, open plan units. 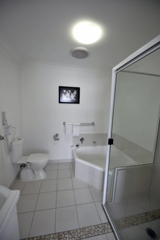 Each unit has 2 bedrooms, 1 bathroom and downstairs toilet, full kitchen and laundry and a landscaped courtyard. Rollaway beds and portacots can be arranged for extra guests. Our spa package is everything you need for a luxurious getaway. Incorporated in this suite is our indulgence pack of relaxing bath products and toiletries. To make your stay extra special we also Provide a fantastic hamper containing champagne and lindt Chocolates. Late checkout is also available to enable you to truly relax and enjoy your stay.